Parasitic mites called varroa, agricultural pesticides and the effects of climate change have all been implicated in what has been dubbed "colony collapse disorder" (CCD). But researchers in India believe cell phones could also be to blame for some of the losses. In a study at Panjab University in Chandigarh, northern India, researchers fitted cell phones to a hive and powered them up for two fifteen-minute periods each day. 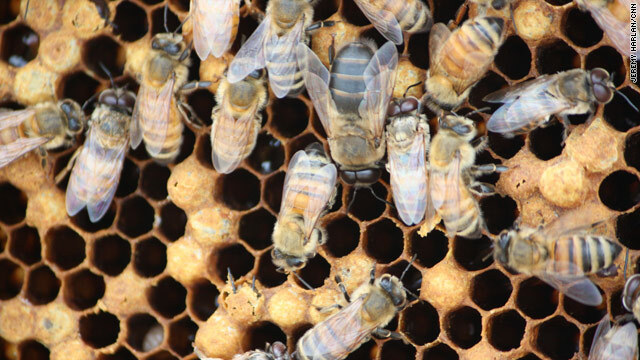 After three months, they found the bees stopped producing honey, egg production by the queen bee halved, and the size of the hive dramatically reduced. It's not just the honey that will be lost if populations plummet further. Bees are estimated to pollinate 90 commercial crops worldwide. Their economic value in the UK is estimated to be $290 million per year and around $12 billion in the U.S.
Andrew Goldsworthy, a biologist from the UK's Imperial College, London, has studied the biological effects of electromagnetic fields. He thinks it's possible bees could be affected by cell phone radiation. The reason, Goldsworthy says, could hinge on a pigment in bees called cryptochrome. "Animals, including insects, use cryptochrome for navigation," Goldsworthy told CNN. "They use it to sense the direction of the earth's magnetic field and their ability to do this is compromised by radiation from [cell] phones and their base stations. So basically bees do not find their way back to the hive." Goldsworthy has written to the UK communications regulator OFCOM suggesting a change of phone frequencies would stop the bees being confused. "It's possible to modify the signal coming from the [cell] phones and the base station in such a way that it doesn't produce the frequencies that disturb the cryptochrome molecules," Goldsworthy said. "So they could do this without the signal losing its ability to transmit information." But the UK's Mobile Operators Association -- which represents the UK's five mobile network operators -- told CNN: "Research scientists have already considered possible factors involved in CCD and have identified the areas for research into the causes of CCD which do not include exposure to radio waves." Norman Carreck, Scientific director of the International Bee research Association at the UK's University of Sussex says it's still not clear how much radio waves affect bees. "We know they are sensitive to magnetic fields. What we don't know is what use they actually make of them. And no one has yet demonstrated that honey bees use the earth's magnetic field when navigating," Carreck said.